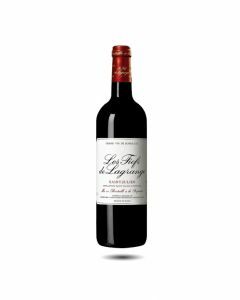 Probably the best loved second wine in Bordeaux, this vintage suits Les Fiefs and brings out the juicy, Cabernet fruit of this successful St. Julian estate. Medium rich, bright, crimson colour, soft and grapey on the attack, with good spice and flavours of black cherries, blackberry and tobacco. There is nice weight on the palate and good, round tannins. In 2013 Château Lagrange's younger vines have produced fruit that is fresh and acidic with pronounced notes of cassis, prunes and blackberry. Supple and approachable on the palate, this is a charming wine to be enjoyed young. The second wine of Lagrange always has a popular following. The 2014 is very bright and fresh with lots of red fruit character and a touch of spice. It is pretty, fruity and and lively with nice persistence and good acidity. Not very dense, this is an attractive wine for easy drinking over the next four or five years. A lovely wine in spite of obvious frost damage, this is pretty and fresh with lovely sweet, ripe cassis flavours, soft almost, tender, good core of freshness mid-palate; a little oaky towards the finish which has yet to integrated but still an attractive wine. Inspite of being badly affected by the frost and losing one third of the crop, this is a pretty dark crimson coloured wine, scented and very forward fruit in the nose, sloes, blackcurrants and blueberries. It has a lovely soft attack, rich and ripe, nice fruit and a good mouthfeel. A very attractive wine. A great result in a challenging vintage. Attractive, bright and deeply coloured with an enticing nose of autumn fruits and oak. Supple, velvety and round on the palate, lovely texture and fine balance between the fruit and tannins.